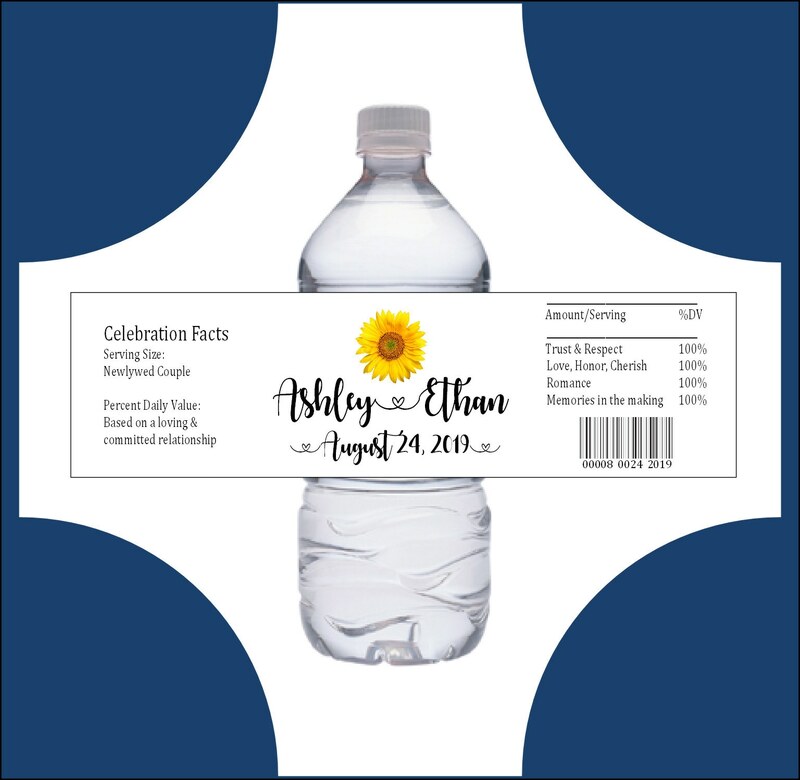 Sunflower Water Bottle Labels. Great for your reception or for guest welcome bags. Price includes: Personalization and Printing. I do all of the designing and printing here on site! When you receive your water bottle labels, they will be all ready for you to put on your water bottles! Please note: Be sure to chill your waters in a fridge before your event. These are regular paper sticky labels and are not completely waterproof. Do not put your water bottles in water/ice after the labels have been put on your bottles. These also work great for your welcome bags! Proofs: This item does not receive a proof and will be shipped out within 3-5 business days. Shipping: This item will be shipped 1st class parcel mail and you will receive a tracking number when the item ships. Once your item ships please allow 2-5 days for delivery. Please check my policies page for all shipping, email and wording submission questions. Life's special moments begin by creating your paper memories! and I'm so excited to be part of your special day! Payment Types: I accept Paypal and Checkout through Etsy using all major credit cards and Etsy gift cards. Washington State Residence pay 8% sales tax. Shipping: I ship all of my items priority mail or parcel post through the U.S. postal service. By shipping priority mail or parcel post you will receive a tracking number once your item is shipped. Please allow 2-5 days for your package to be delivered after you receive a shipping confirmation. Once your package has shipped,a tracking number will be emailed to the email you provided on your payment. If you live outside of the United States please read each listing carefully for shipping costs and shipping could take up to 3 weeks to be delivered. Items that receive a proof: After you approve the proof your item(s) will be scheduled to ship within 7-10 business days (depending on how many orders are in front of you) If you are needing your item sooner please request a rush payment option. (Rush option only means we will print and ship it sooner than the 7-10 days, but it will still get shipped priority mail. Please review the listing you are purchasing to view printing/shipping times on that item and details concerning that specific item. Items that do not receive a proof: These items will be shipped out within 3-7 days. (Depending on how many orders are in front on you. I strive to ship your items out as soon as possible. After purchase you will receive a shipping date of your item so be sure to look at the confirmation email you receive from your payment. Holiday shipping note: Because of the holiday and slower shipping from the usps I will not be shipping between December 23- January 3rd. I will be answering emails and doing proofs during that time. Return Policy: Unfortunately, due to the fact that my products are intended for one time usage and to keep my prices very low, I cannot accept returns or exchanges on any of my products. All sales are final. Your products are packaged professionally for safe shipping and your products are thoroughly examined before shipping. So, be sure to look over your proof if your item(s) receive a proof and when submitting your information be sure to edit/review your wording before submitting it to me. You are going to love your items! I make extra effort to pay attention to detail so your items exceed your expectations. 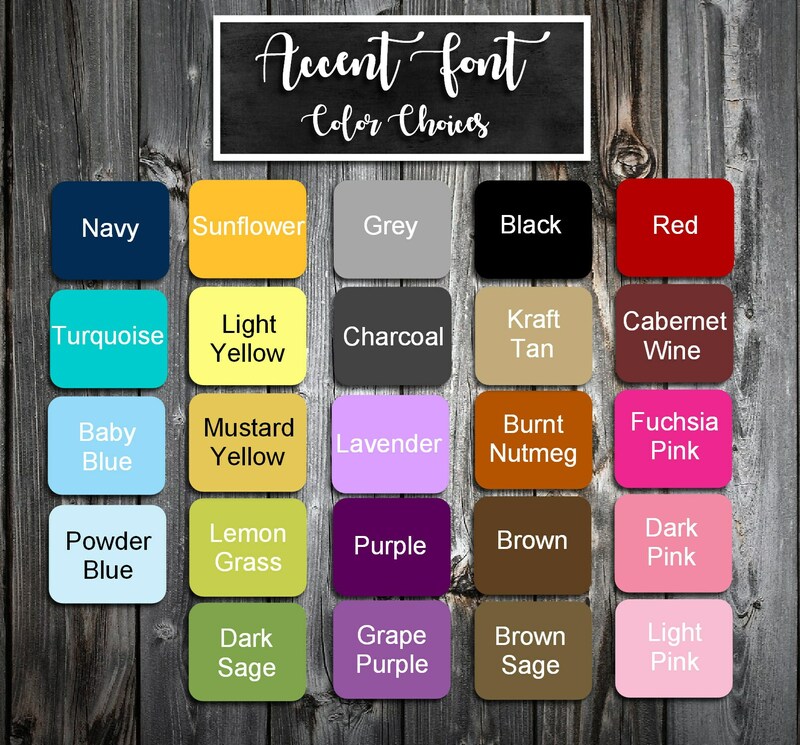 Wording submission: After you purchase and have your wording ready for your personalized item(s) you can either email it to me at creatingpapermemories@gmail.com or put your wording in an Etsy message to me. Make sure you review your wording and read the listing details for wording submission instructions. Be sure to check the listing you are purchasing to see if your item will receive a proof. Items that have a lot of wording (Wedding invitations, Programs, Fans...etc) will receive proofs. Smaller items with less wording (names and event date) will not receive proofs. Proofing Process: After purchase and wording has been received you will be sent a free email proof to the email you provided us on your payment or provided with your wording submission. Proofs will be emailed within 1-3 days from when wording was received. Email proofs are sent in a pdf file for easy viewing. Once an email proof is approved it will be sent to the printing que. Once in the printing que there cannot be any changes made. So, be sure to approve your proof after all changes have been made. Helpful tip: Have several people look over your proof. That can be an assurance that any changes can be found. Changes on Proof: Changes are easily made by sending me an email This way all spelling and changes can be accurate. Be sure to check the listing you are purchasing for wording submission instructions and proof process details.